Fishery management on the Great Lakes rests with non-federal governments: eight states, the Province of Ontario, and U.S. Tribes. Federal agencies and the binational Great Lakes Fishery Commission also play a role in Great Lakes restoration. Although at least two jurisdictions border each Great Lake (seven border Lake Superior), cooperation has not always been high on the agenda. Indeed, starting almost from the time of European settlement in the region, each jurisdiction managed its bordered portion of the lake with little regard for the other jurisdictions. The result was management chaos, overfishing, habitat loss, and fishery decline. In this parochial atmosphere, cross-border cooperation was nonexistent and elusive. 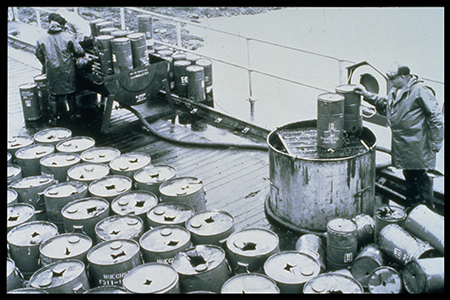 Between the late 1800s and the 1950s, the states and Ontario tried no fewer than 40 times to create a lasting mechanism for cooperation, or at least to harmonize their fishery regulations. Two treaties—one in 1908 and one in 1946—to mandate cross-border cooperation were also proposed but rejected because the treaties gave too much power to a binational commission. The sea lamprey invasion jolted the jurisdictions out of this insular approach and moved them toward cooperation. The jurisdictions realized that sea lampreys were a basinwide problem and one too big for any one authority to manage. Moreover, federal resources would be needed to overcome the sea lamprey problem. 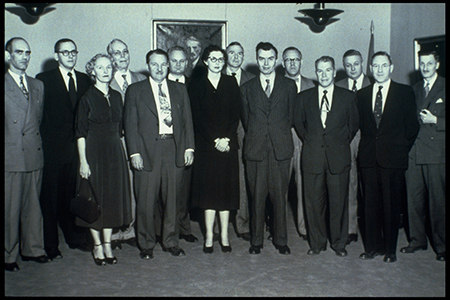 The 1954 Convention on Great Lakes Fisheries—a treaty between Canada and the United States—created the Great Lakes Fishery Commission to control sea lampreys, advance science, and help agencies work together. The 1954 convention succeeded where the other treaties failed because it compelled the commission to address the sea lamprey problem (a problem too big for the nonfederal governments to manage) while explicitly denying the commission authority that rested with state and provincial governments. However, recognizing the basin's long history of parochialism, the treaty did direct the commission to establish "working arrangements" among the agencies. The goal was to end the insular approach and instead establish a culture of cross-border collaboration. Increasingly, the Great Lakes Fishery Commission became a focal point for coordination. This coordination turned routine after the commission created lake committees in 1965 as a place for agencies to share information. In the 1970s, during an era of strategic planning and federal growth in environmental initiatives, Great Lakes states rejected an opportunity to form a U.S.-only coordinating body, known as a Regional Fishery Management Council under the (Magnuson) Fishery Conservation and Management Act of 1976, and instead opted to create a Great Lakes version, which would include their provincial counterparts. Agencies asked the commission to help create a strategic institution to heighten their cross-border collaboration. 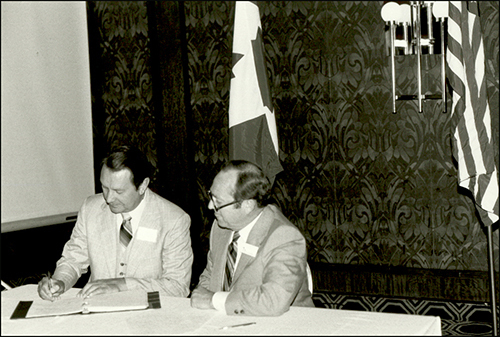 This agreement was the 1981 Joint Strategic Plan for Management of Great Lakes Fisheries. The state and provincial agencies agreed to use the existing lake committees as the plan's "action arms" and to make the committees a more robust, strategic process. After court cases of the 1980s re-affirmed U.S. tribal management authority, two intertribal organizations signed the plan and joined the lake committees in 1988 and one joined in 2014. Through the Joint Strategic Plan, fishery management agencies work together to identify shared objectives, develop plans to meet those objectives, share information, collect and disseminate data, and coordinate law enforcement. The agencies also use the plan to recommend annual total allowable catches for Lake Erie walleye and yellow perch. Federal agencies have also signed the plan and use its structure to work closely with non-federal partners. Although the plan is non-binding, it does create an ongoing mechanism through which the agencies meet regularly and cooperate across borders. Today, cooperation among fishery managers and scientists is engrained and information routinely flows across borders. Agencies leverage scarce resources and managers sustain robust relationships that allow for ongoing collaboration. The Great Lakes Fishery Commission facilitates this collaboration through strong support for the 1997 Joint Strategic Plan for Management of Great Lakes Fisheries. The sea lamprey invasion in the Great Lakes happened slowly, and in the shadows of three major pillars of North American history: The First World War, the Great Depression, and the Second World War. Sea lampreys are native to the Atlantic Ocean (as the name implies), where they have evolved for hundreds of thousands of years to parasitize larger-bodied marine fishes. Marine dwelling sea lampreys eventually detach from their host, usually leaving nothing more than an unsightly scar. Afterwards, they migrate up freshwater tributaries to spawn. A slightly smaller, freshwater version of the sea lamprey was reported in Lake Ontario as early as the 1850s—most likely entering through the Erie Canal. Food and environmental limitations kept the sea lamprey population in-check, while Niagara Falls provided an impassible barrier for the parasites into Lake Erie. The opening of the Welland Canal allowed sea lampreys to bypass Niagara Falls and enter the upper Great Lakes. While the Welland Canal connected Lake Ontario to Lake Erie as early as the mid-1820s, sea lampreys were not reported in Lake Erie until 1921—nearly 100 years later. So why the slow start to what would eventually become one of the most catastrophic ecological invasions in Great Lakes history? Several environmental and physical factors have been credited. Throughout the 19th century, the Welland Canal was repeatedly widened and modified to increase the passability of newer and larger ships. 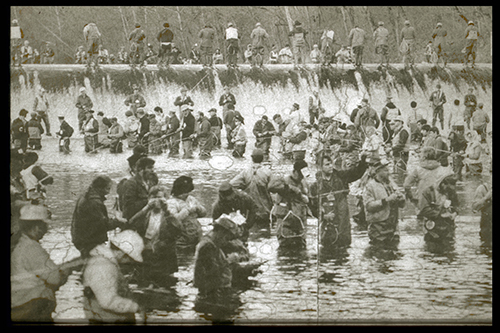 A complete overhaul of the canal was underway by 1913 with large modifications completed by 1919&mash;diverting new water sources into the canal, widening the channels, and increasing the flow from Lake Erie into Lake Ontario. Given that sea lampreys are programed to swim against currents for hundreds of miles to reach upstream spawning grounds during their single spawning migration, the final canal modification unwittingly provided a super-highway for sea lamprey to move into Lake Erie. Two years later in the fall of 1921, as Mr. Alexander Crewe of Crewe Brothers Fishery was lifting a pound net teaming with fish several miles out from the coastal town of Merlin, Ontario, he came face to face with a slimy attachment to a whitefish that was unlike any creature he had seen before. The specimen was torn from the fish, dropped into a jar, and sent to the University of Toronto where it was confirmed to be a parasitic sea lamprey. John R. Dymond briefly acknowledged the specimen in his 1922 publication, "A Provisional List of the Fishes of Lake Erie." Over the next decade, sea lampreys would be reported sparsely throughout Lake Erie, but no red flag would be flown. It wasn't until the middle of the Great Depression that the true implications of this new resident to the Great Lakes were realized, albeit too late. By the start of WWII, sea lampreys began turning net loads of commercially important Great Lakes fishes into Swiss cheese. Lake trout were nearly extirpated from Lakes Huron and Michigan. Sea lampreys were on the cusp of invading the last stronghold of the native lake trout—Lake Superior. The gruesome sight of prolific sea lamprey predation on commercially important fish species awakened Canada and the U.S. to the dire state of the Great Lakes fishery. For centuries, the Great Lakes fishery provided a direct, unregulated source of protein throughout North America—a resource that was considered inexhaustible. The fishery was considered the property of whichever state or province it bordered. Sea lampreys, unhindered by borders, managed to push forward into Lake Erie (1921), Lake Huron (1937), Lake Michigan (1936), and eventually Lake Superior (1938). Meanwhile, the decline of commercial fishes throughout the Great Lakes was obvious by the 1930s when the annual harvest began to drop below 100 million pounds—roughly the weight of the RMS Titanic. Around this time, the fishery sustained multiple devastating blows. As commercially important fish species continued to collapse, fishing pressure shifted towards other less desirable species with a lack of uniform regulations. There was a deficiency of Great Lakes fishery science. At the same time the Great Lakes were facing an increase of habitat loss and pollution in parallel with ecological disturbances by smelt and alewives. All these factors assisted sea lampreys in their path of destruction. 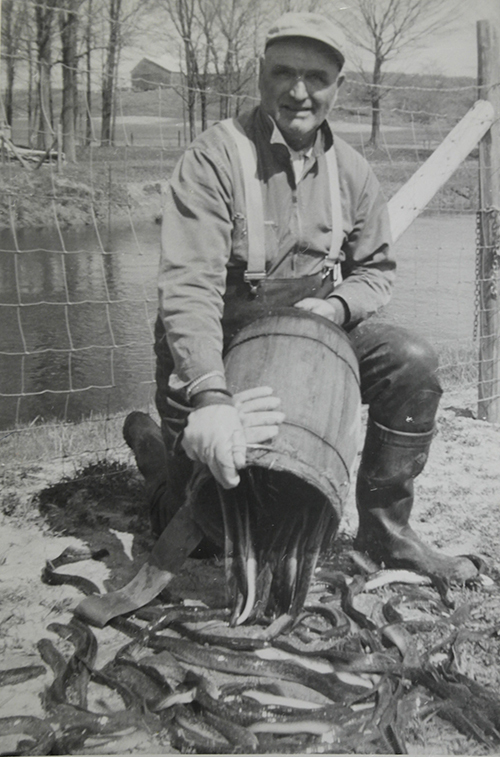 Shortly after WWII, Ontario, together with the eight US Great Lakes states, understood that cooperation was the only option if the menace of the sea lamprey was to be brought under control and Great Lakes fishery was to be better managed.